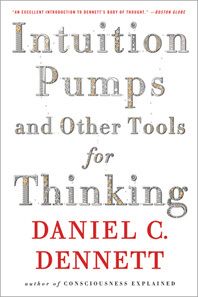 Intuition Pumps and Other Tools for Thinking offers seventy-seven of Dennett’s most successful "imagination-extenders and focus-holders" meant to guide you through some of life’s most treacherous subject matter: evolution, meaning, mind, and free will. 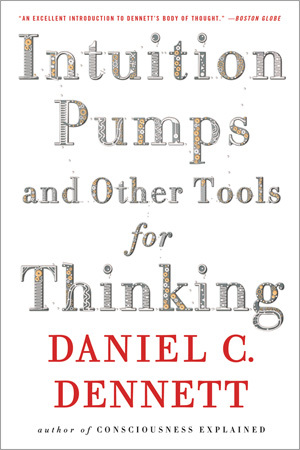 With patience and wit, Dennett deftly deploys his thinking tools to gain traction on these thorny issues while offering readers insight into how and why each tool was built. Alongside well-known favorites like Occam’s Razor and reductio ad absurdum lie thrilling descriptions of Dennett’s own creations: Trapped in the Robot Control Room, Beware of the Prime Mammal, and The Wandering Two-Bitser. Ranging across disciplines as diverse as psychology, biology, computer science, and physics, Dennett’s tools embrace in equal measure light-heartedness and accessibility as they welcome uninitiated and seasoned readers alike. As always, his goal remains to teach you how to "think reliably and even gracefully about really hard questions."